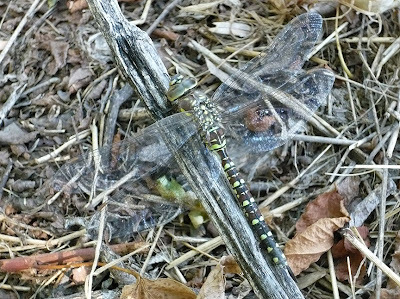 Calling all odonataphiles- I think this is a Lance-tipped Darner in its green form, but according to my Dragonflies Through Binoculars guide, there are some potentially similar dragons to rule out. Anyone know for sure? I photographed the critter last weekend at Barr Lake State Park, Northeast of Denver. 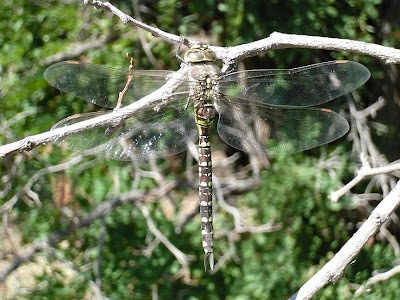 Whatever it is, I really like the intricate patterning and green coloration theme that this dragonfly has. 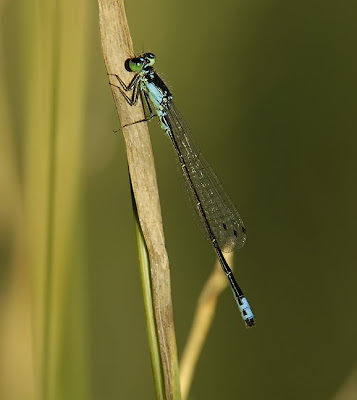 While we're at it, I have a few unknown damselfly pics from of late, too. Both were at Walden Ponds Wildlife Habitat in Boulder. Seems like there are a few regional guides to these for parts of the country, but none that really cover Colorado well. 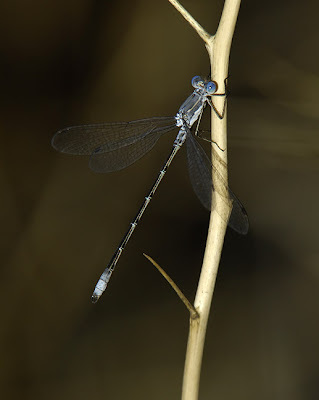 I found a great web site that probably has them (Odonata Central), but quite honestly I haven't had the time to look through it all. I guess I should buckle down and print all of the damsel pics they have there so I can compile a makeshift guide to flip through when I find unknown damsels. Anyway- here they are. Proves that you don't have to know what they are to enjoy them, but if anyone knows, leave a comment. Thanks! Why is the crab so crabby? Maybe because he doesn't have a scope!! Mutts, 8/25/07: Why am I so crabby? Most of the good shorebirding spots within an hour or so of here (Longmont, CO) are too full of water- no mud = no shorebirds. I've been avoiding dealing with noise reduction software until recently- I figured that when publishers needed to, they would post-process my unaltered original pics however they needed anyway. Quite honestly, I like taking pics more than I like tweaking them, so my regimen for getting shots ready for the web has been pretty simple- crop, re-size, adjust contrast if needed, sharpen some if needed, and save it for the web. Doing that takes me under a minute per shot, so I can get though batches fairly quickly. Some shots get a little electronic fill-flash, some night shots get red-eye treatment, but mainly that's it. 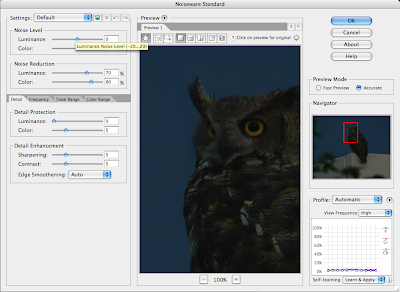 Recently, though, I read a post at The Nemisis Bird about a noise-reduction plug-in that works with Photoshop- it sounded simple so I thought I'd give it a whirl. 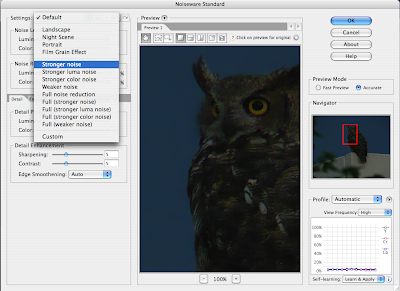 The software is called NoiseWare, and when you download it and install it ($50 for the standard version) you will find it as an option to apply under the filters menu in Photoshop. 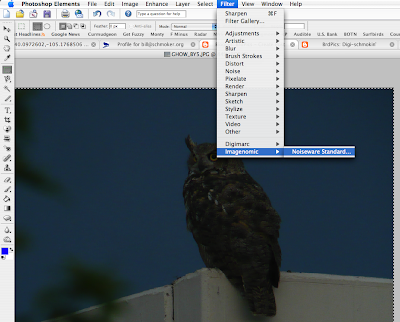 (It works with any version- I use Photoshop Elements because it comes bundled with the Leica C-Lux 2.) I've had great luck just using the default setting or the "stronger noise" setting, but it is full of adjustment sliders for this and that (technical, huh?) if you want to fool around with customizing your settings. Not bad, but when you click the picture to enlarge it you will see the noise that I'm talking about. Newer cameras sensors are much less prone to noise at high ISOs than they used to be, but you'll see it, especially in dark, clear areas like the sky or in dark foliage. Even when I was using cameras with much more noisy sensors I'd bump up the ISO when I needed to get a faster shutter speed, because I'd rather have a sharp shot with noise than a soft one that was more "quiet." Toggle back to the un-noise-reduced version to compare the two- a pleasing difference, I think! If you've been using this filter and have some tips on getting the most out of it I'd love to hear from you- leave a comment! All in jest, of course- congrats on the book, Cinnamon (& Sharon.) Looking forward to it. 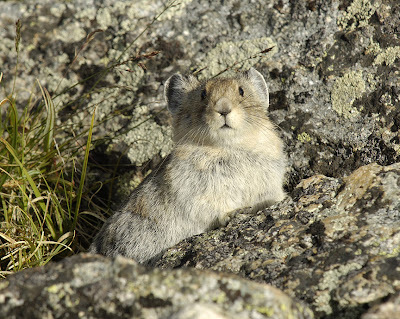 Like other lagomorphs, pikas don't hibernate despite living year-round on the arctic tundra in places like Mount Audubon, Colorado, where I snapped these pics. 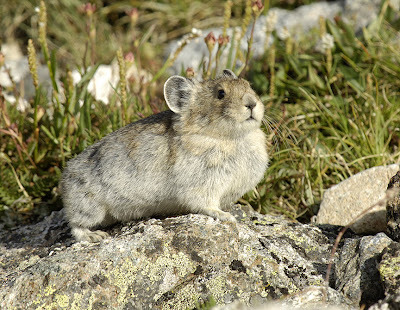 Instead they gather plant clippings all summer and make hay, piling them up to dry in talus patches and stuffing them away to dine on all winter in their rocky abodes drifted under insulating snow. We also saw three snowshoe hares in their summer-brown coats on the drive in, but photography was out of the question since they were in the pre-dawn headlights and then gone. Guess to work on them I need a camera trap like the above-mentioned Camera Trap Codger- that guy nails secretive mammal photos like no other! And now, for your viewing pleasure, sit back and enjoy our dance selections for today. Both feature mash-ups blending original footage with songs that originally weren't matched to the choreography. First, we start with the moonwalking manakin (Red-capped Manakin for those keeping a birds-on-blogs list) busting a move to Michael Jackson's iconic Beat It. Then we compare the avian fancy-stepping with a dance number featuring Gwen Verdon on the Ed Sullivan Show, re-mixed with the Unk hip-hop anthem, Walk It Out. ...but we're not going to be skinning any cats around here. 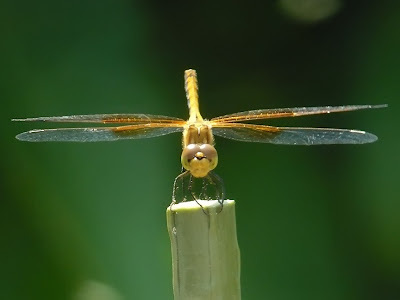 We might want to do some more dragonfly photography, though! 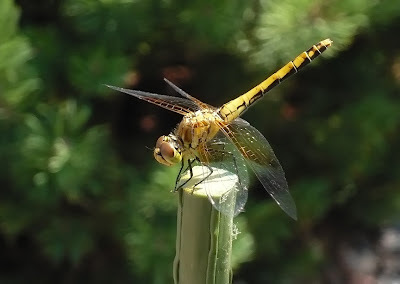 I had this cooperative Band-winged Meadowhawk in my garden the other day. It had a favorite perch where it based its hunting operations for much of an afternoon, giving me a chance to fool around with some different photographic techniques. I've made a little commentary on each, and summarized a few advantages, disadvantages, and tips for each method. Advantages: Quick to get on target, hand-holdable even at high aperture/low shutter speed with image-stabilizing system. Lots of flexibility & creative control. Disadvantages: Cost (can quickly get into 5 figures.) Heavy weight to bear when you carry around large telephoto lenses. Some people most comfortable using tripod with large lenses, even those that are image-stabilized. 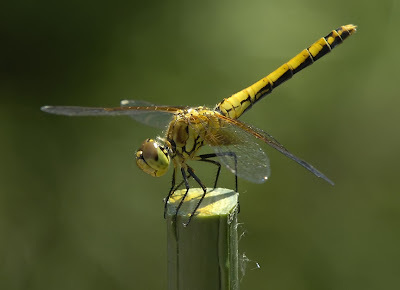 Tips: Get the aperture to f/10 or above to try and keep the wings and body focussed. This can be tricky since these parts are usually at right angles to each other! Next, I set up my digiscoping rig on my Leica APO-Televid 66mm scope and 26X WW eyepiece. 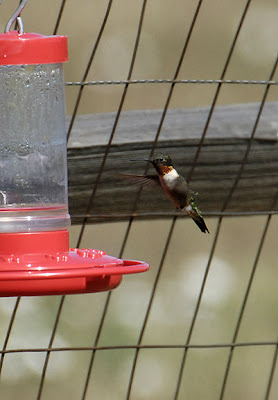 I recently was upgraded to Leica's C-Lux 2 camera, and I've been super happy with this micro-sized powerhouse. I crept my tripod up to about the inner limit of the scope's close focus so I could keep the camera zoom down to about 2x for the best quality images. One really nice thing about this camera is the ability to adjust critical controls like the flash mode (turn it off for digiscoping) and the exposure compensation with their own dedicated buttons instead of going through menus. As the background changed I could quickly compensate down a bit to keep the bright insect parts from blowing out. The monitor on this camera is amazing- it covers almost the whole back of the camera and is bright, even in direct sunlight. Advantages: Modest cost if you already own a scope. Even if starting from scratch, cost is comparable to mid-level DSLR telephoto zoom systems and more affordable than big-lens systems. More magnification potential than any DSLR system. Camera much smaller and simpler to operate than DSLR. Disadvantages: Must shoot from stable tripod for best results. A bit bulky and more complex to get working "right" than a DSLR system. Fewer creative controls than DSLR. Tips: Can be a God-send when you can't approach targets freely due to access (like on boardwalks), environmental issues (like walking through endangered orchids), or if the target is just skittish and won't allow close approach. Get a camera that won't vignette, top scope optics, a wide-angle fixed-power eyepiece, and a solid digiscoping adapter for best results. A remote shutter release can be a real help, too. Finally, since the dragonfly was so cooperative, I decided to try photographing it with just my C-Lux 2 camera on the macro setting. Luckily, when I blew it and moved in too fast, sending it off its perch, I could retreat and it would come back and re-set on its mark. Amazingly, after several attempts and some very slow movement I was able to get the camera within a few inches of the critter, first by walking in towards it low and slow and then by extending my arms reeeaaaaalllllly slowly to get the camera up in its grill. 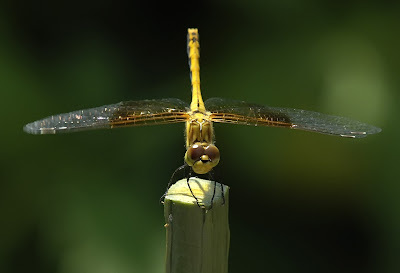 In my experience most dragonflies won't tolerate this, but if you are patient many butterflies will. 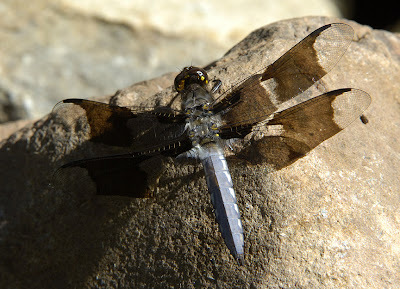 Some dragonfly paparazzi will first net one and then chill it in a cooler before posing it. They then have a little window of opportunity before the predator warms up and flies away. Advantages: Great potential for detailed photos. Most affordable option and least bulky- most P&S cameras now will fit in a shirt pocket. 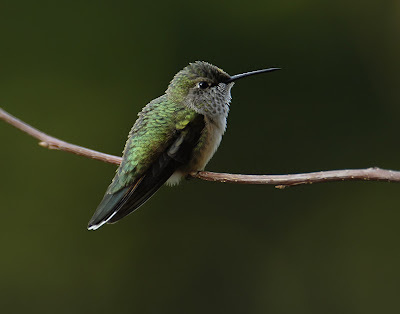 Works very well on cooperative subjects including in-hand birds at a banding station, many reptiles (but I prefer telephotos for the ones that bite), and sessile targets like flowers or dead things. 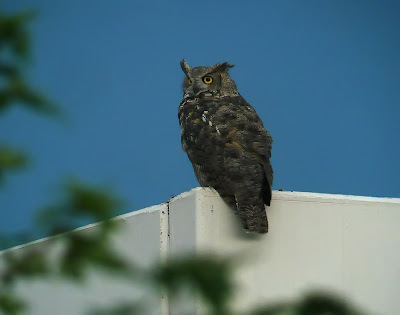 Can use same camera on the scope for digiscoping as needs dictate- in fact, some cameras seem to work best using their macro setting when digiscoping. Disadvantages: Doesn't work very well for skittish subjects. 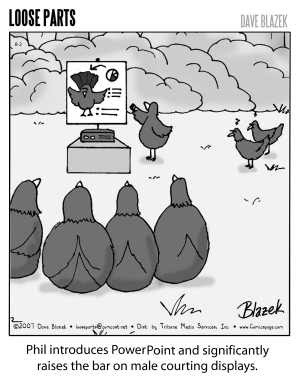 Not good for most bird photography situations. Must get very close to subject. Tips: Be patient and learn to move slowly and unobtrusively when approaching anything that can fly, run, or swim away. An image-stabilized camera like the C-Lux 2 gives you much more leeway with shutter speeds as you extend your arm towards target, a less stable position but one less likely to spook the bug. 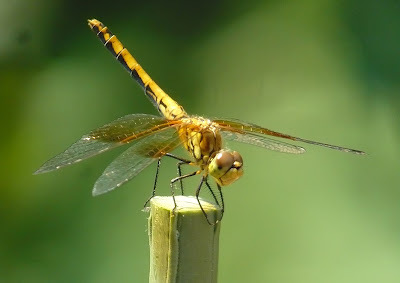 I hate the "Common" adjective in bird names, and it isn't much better in dragonflies. C'mon, animal-namer-people, get a thesaurus and try a little harder, will 'ya? 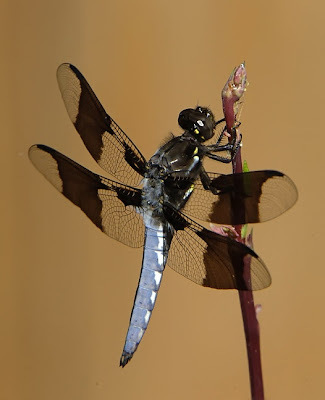 Instead of Common Whitetail, how about something like Pied Whitetail or Zone-winged Skimmer? 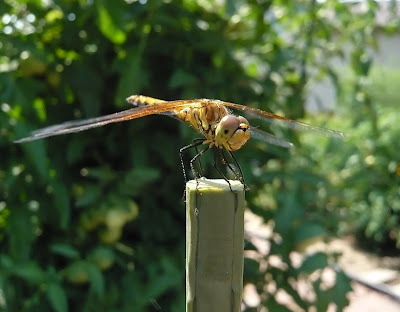 I had this striking dragonfly in my backyard a couple of weeks back. Interesting to see how lining it up with different backgrounds changes the overall feel of the shot. 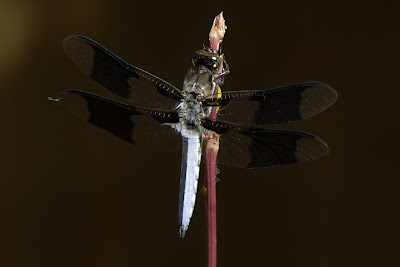 The trick with the darker backgrounds was to avoid overexposing the bright abdomen. On the pic with the darkest background I had to compensate -1.0. 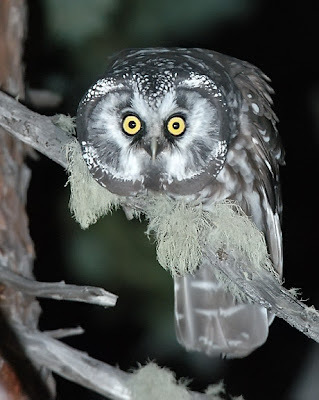 There's a neat article out in this month's Ecology detailing a University of Colorado study showing the beneficial effects of birds on pine forests. So yesterday a CU publicist emailed me to see if they could use a Mountain Chickadee picture to send out with their press release. As an alum (I got my master's degree there in '01), I happily obliged, sending them a couple to choose from. Well, imagine my surprise when I pulled my Denver Post out of its orange plastic bag this morning and saw my chickadee pic on the front page, with an accompanying article about the study! Here's a link to the online article by the Post, featuring a couple of my Mountain Chickadee pics. I wonder where else they might turn up?